Anything with Grana Padano, I love. If there’s also a pasta masterclass in the mix and a well known Italian chef added to it, then I am sold. That’s why I wasn’t going to miss one of the events which opened the 2018 Italian Cuisine Week in London. A yearly event organised via Italian embassies across the world, it aims to promote our food culture and excellencies. 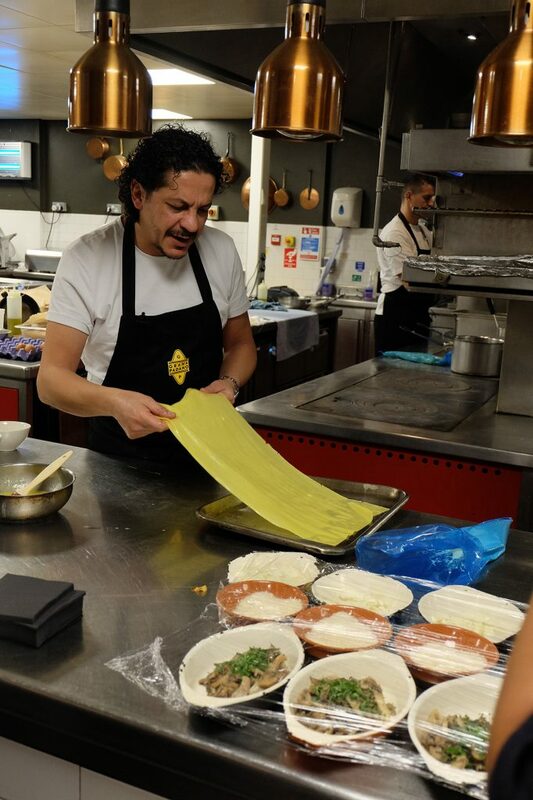 The session I was truly lucky to attend was a fresh pasta masterclass organised by Grana Padano UK with chef Francesco Mazzei in his N1 restaurant Radici. 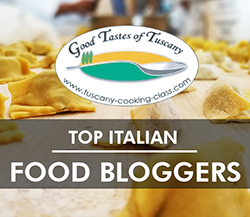 I joined nine more guests (bloggers, journalists and influencers) in the private dining room of the venue where we were welcomed by Francesco and the Grana Padano PR team. While sipping a glass of prosecco, we watched a very informative video clip filmed in one of the cheese’s producers (they are all part of a consortium). Francesco told us it was the first time he saw the video too; it was filmed during his visit to the factory. 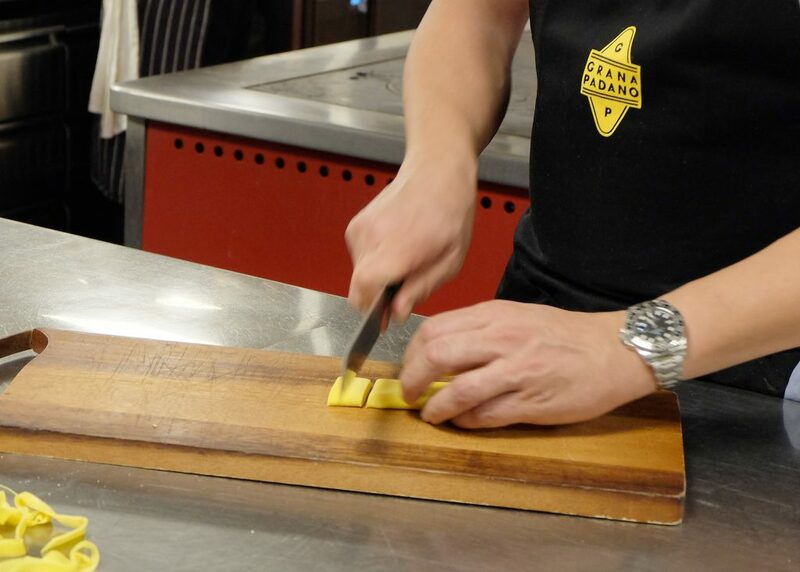 During the visit, Francesco was able to have a go at cutting and branding one of those big wheels of cheese. 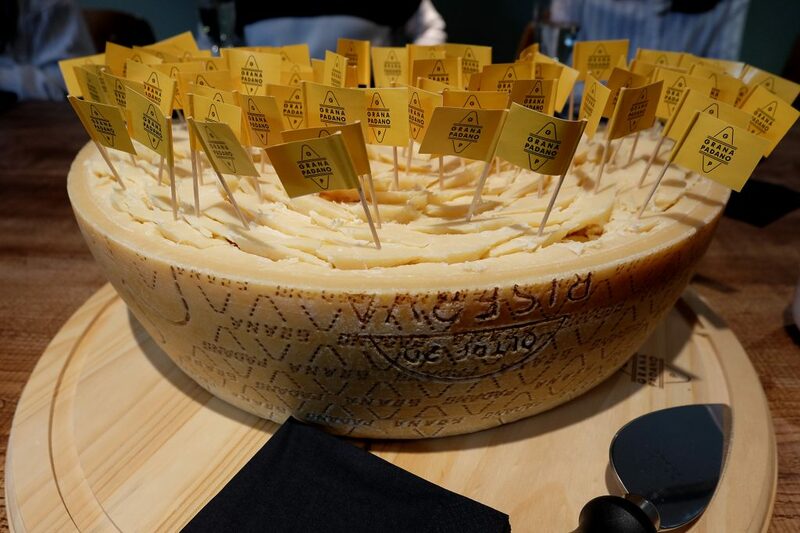 Only specific provinces and regions in Italy are able to produce Grana Padano cheese. It’s from these regions that Grana Padano’s traditions and heritage were established. In the Pianura Padana area, production started as early as 1135AD. Having reclaimed a marshy area in the Po River plain, the Cistercian monks built Chiaravalle Abbey and started cultivating crops and rearing livestock. Soon after, their land-based economy led to an increase of food production and a surplus of milk, which far exceeded the modest needs of their community and the local population. After the video, Francesco talked us through 3 differently aged Granas, between 10 and 24 months. 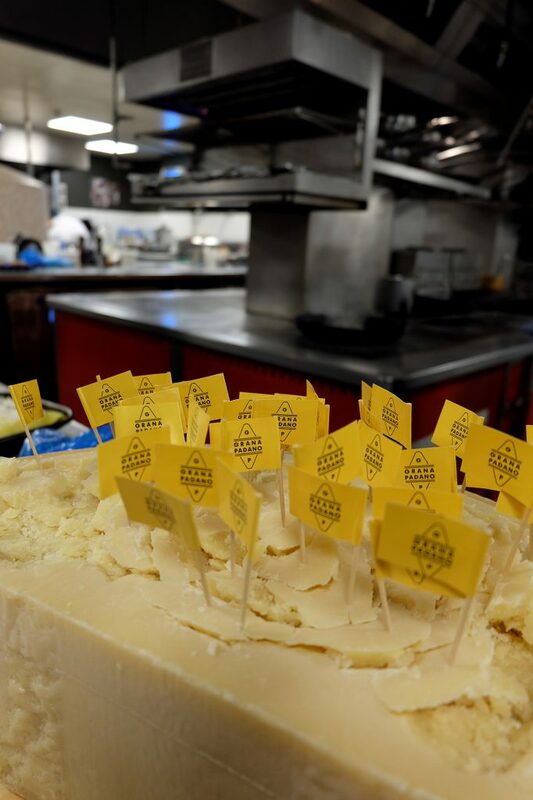 Despite having attended many Grana Padano events, the 10months really surprised me. It was so fresh, so mellow… much less grainy and piquant than a more aged version. If I’d tasted it blindly, I might have mistaken for a caciotta, perhaps. Everyone loved it. The 27 months is of course, an excellent cheese, the ‘Riserva’. Really a special taste to it, grainy and harder bite and just wonderful. It marries wine beautifully and can easily be served as a canape. We then moved on to the kitchen, still not as busy as the dining room was not full yet due to the early hour. 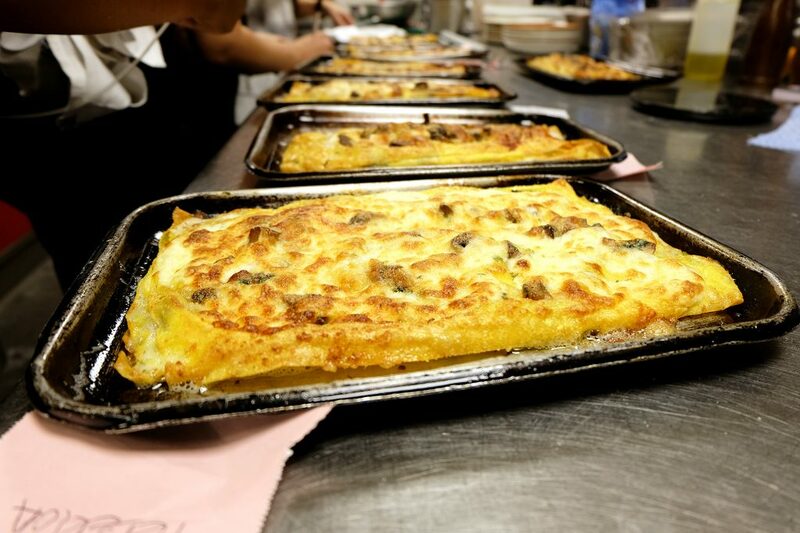 Francesco let us try his ‘Pastastraccia‘, what I would describe as a flattened lasagna. Flattened, but soooo delicious! 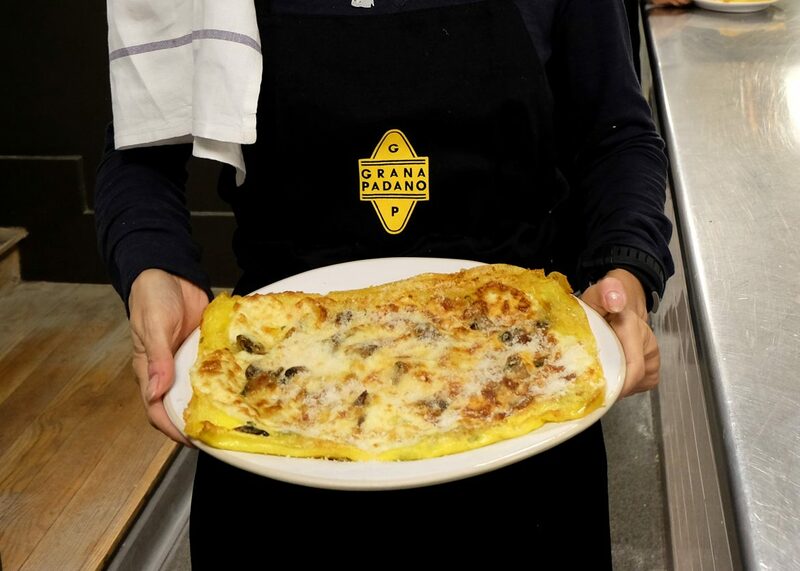 He makes it with fresh bechamel sauce, sauteed seasonal mushrooms, herbs, fior di latte and of course, grated Grana Padano. 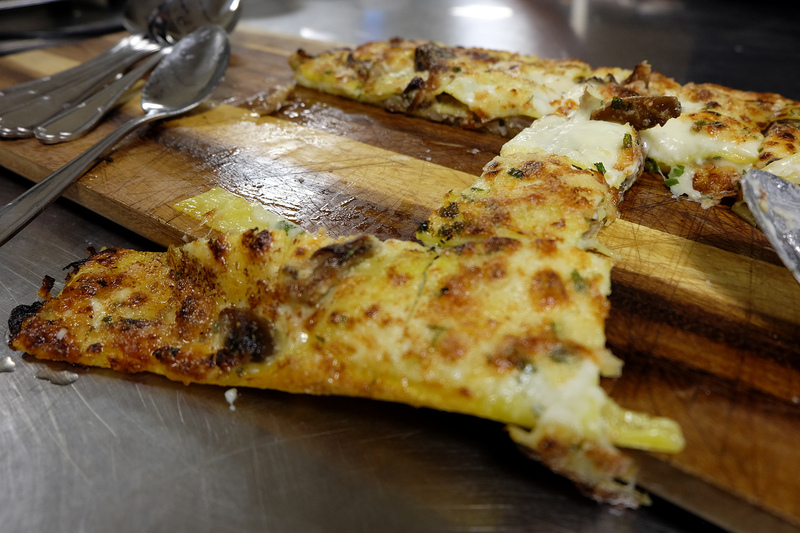 We tried a bite and then the chef showed us how to make it… looked simple! We then had to try and make our own with the ingredients already laid out. 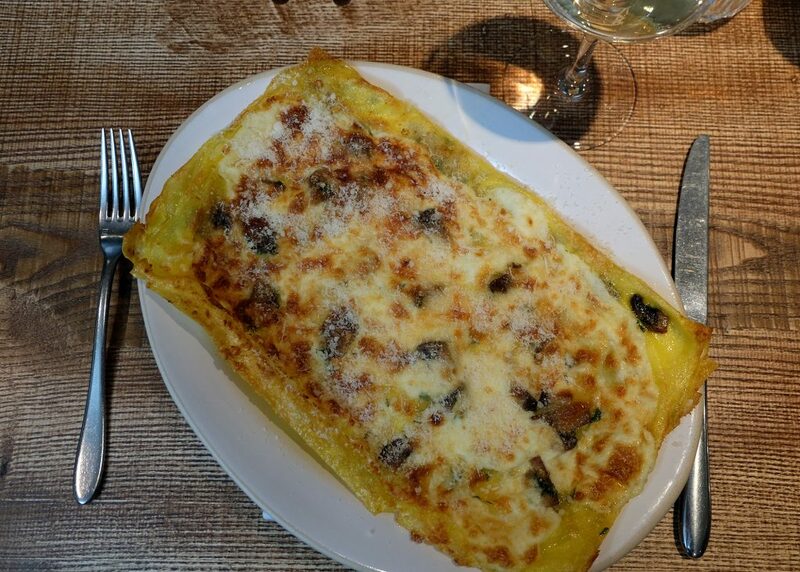 Of course, I was not going to even attempt to make such a beautifully smooth pasta sheet… but I will because we took the recipes home so watch this space! 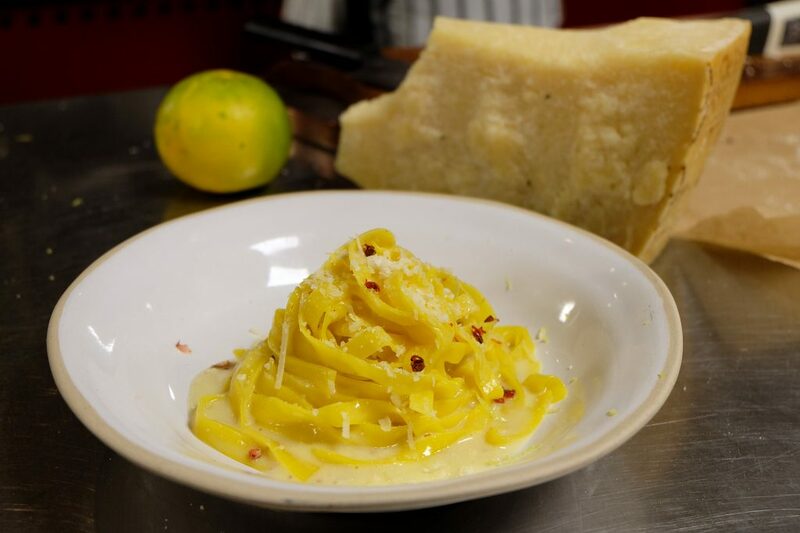 The second dish Francesco showed us is a deceitfully simple Tagliatelle Grana Padano and Pink Peppercorn, basically a slightly more sophisticated version of the classic ‘cacio and pepe’. The black pepper is replaced by the more gentle and very pretty pink peppercorn, the cheese is of course Grana and there’s a shaving of lemon zest which really lifts the rich sauce, and adds a delicate, fresh edge to it. We were also lucky enough to get some extra tuition, and the chef showed us how easy (easy?) 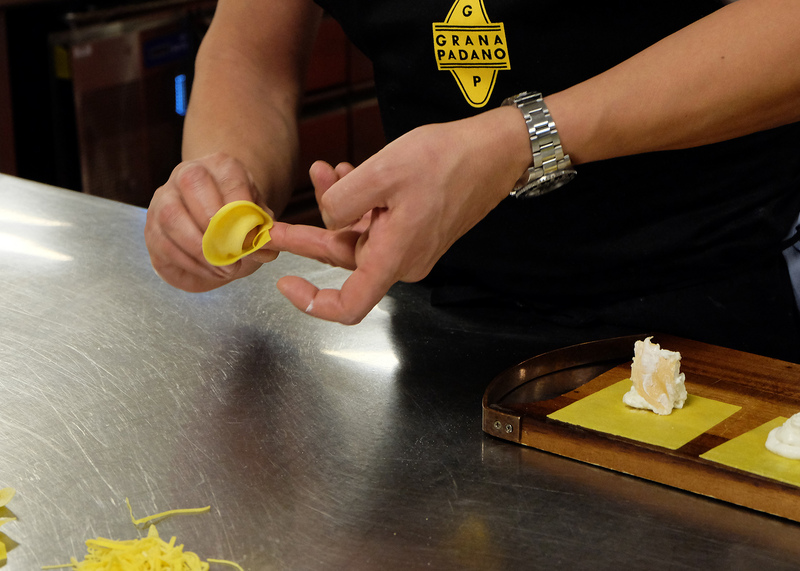 it is to make a number of fresh pasta types, from taglionini to ravioli. 3 of us volunteered to comepte in making their own version and we all had to vote for the best one, who won a signed copy of Francesco’s cookbook. We went back to the dining room to enjoy our pasta and chat some more with Francesco before the end of the evening. Having ‘direct’ access to a chef of his calibre is always a great opportunity to pick up on tips and tricks as well as find out more about the chef himself.